I am Srinath Ranga, Director of Opteamize. Today, I am starting a series of posts covering material used in our blogging workshops and extracted from a guidebook I have released titled ‘Business Blogging for Beginners’. We have now gone into the third version of the book. Third time’s the charm! – What are vlogs and podcasts? – Why Should you blog? v. I don’t know what to write about? VI – Note it down now! 1. Where should I jot down my ideas? 2. What should I be aware of? 3. What should I store? 4. Where should I store them? 5. What should I write on? 6. Where shall I set up my blog? 7. Where shall I upload my blog? 8. Is the content SEO-friendly? 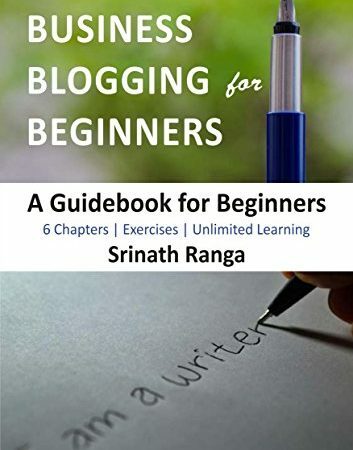 I will also throw in useful tools, exercises, tips, and ‘further reading’ links to improve your blogging skills. If you want to learn about blogging, join our digital marketing course, or contact us for more. Update: You can proceed to Lesson One now.